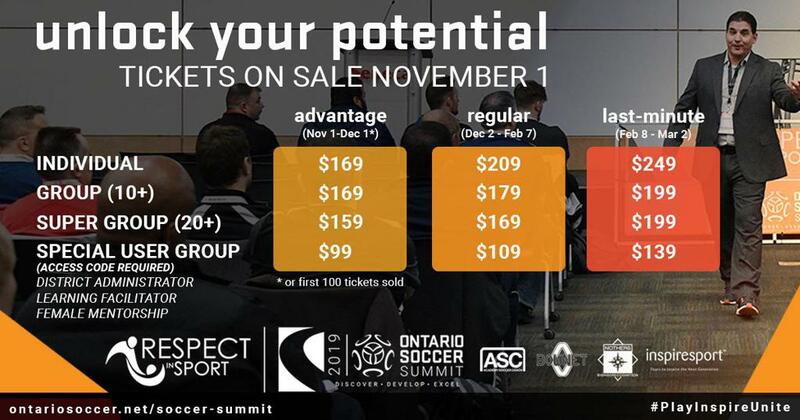 Tickets will go on sale November 1, 2018 and the full roster of 2019 speakers will be revealed at that time, but to assist Clubs, Academies, Districts and Leagues in their planning, the options for purchasing passes to Ontario Soccer Summit 2019 have been released publicly. As well, the pricing and location options of the Ontario Soccer Summit 2019 host hotels are now available online for those planning getaway options for a start of the new season staff team building event. As previously announced the Ontario Soccer Summit 2019 will be held in London, Ontario from March 1-3, 2019 and supported by the Elgin Middlesex Soccer Association (EMSA). Ontario Soccer Summit 2019 in partnership with Respect in Sport will feature three days of on-field and in-class sessions targeted at Coaches, Match Officials, Administrators, Soccer Leaders and includes speakers-presenters from esteemed organizations from around the world. This event services as your annual personal and professional development weekend where you can “Discover, Develop and Excel”. If you have any further questions regarding ticketing or Ontario Soccer Summit 2019, please contact Robyn Gmeindl.